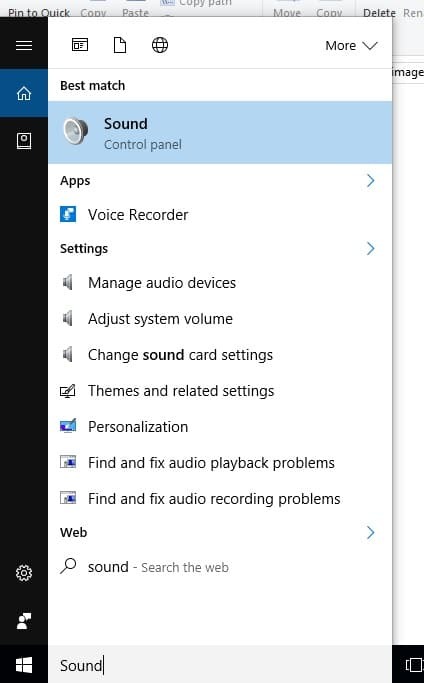 Users finding solution on how to change or Disable notification sound in windows 10. Because some important notification you will get more in less interval time. Here’s the best possible solution on how to put your incoming notification in ignorable mode or in no interrupting stage. 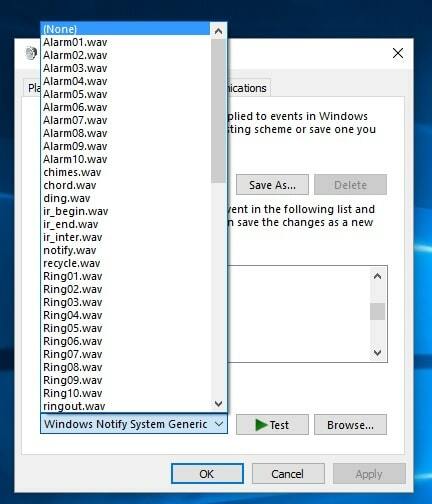 Not only notification sound but also change Program Error, Startup sound, Calendar Reminder, Open program or Sleep system. We also set custom sound or ringtone from selected .WAV File format type. You have another in format; first prepare it by converting in to .WAV format. 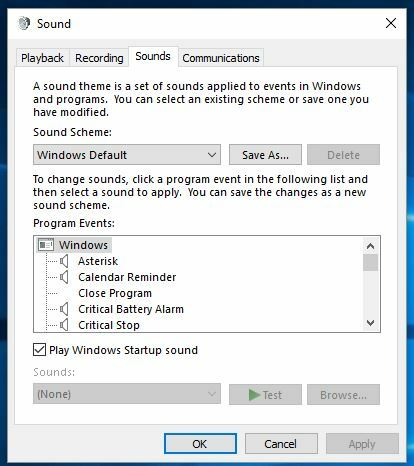 1: From search box near to start menu, Type “Sound” or Open Sound from control panel (Windows 7 or Windows 8). 2: From Sound popup window, Click on Sounds from top tabs. 3: Scroll down Program events list under Windows. And find “Notification”. Notification option will listed in character sequence for easy to find. 4: Once you find, Click on it and choose “none” from sound Dropdown box. Otherwise Browse “.WAV” file from Browse option. 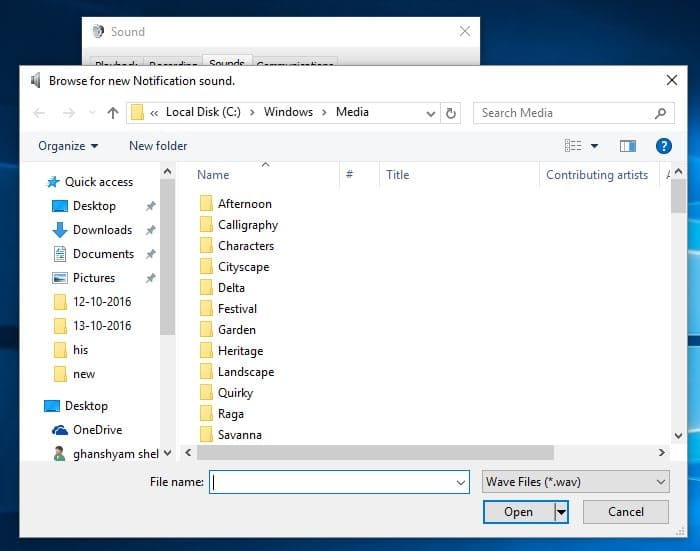 More sample sound files are available in your windows 7 logical drive C:\Windows\Media Choose from hundreds of different categories of sound files. Great customization, yes you have an option for control over selected types of notifications. 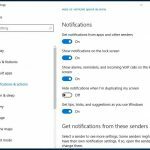 By disable/ Enable of notification from notification settings. Here, I am not talking about push notification that you receiving on your Desktop or Laptop browser. That’s we can manage it with only Google chrome settings. 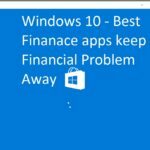 Are you looking for change or mute sound on windows 10, Follow the same steps for older version of windows. 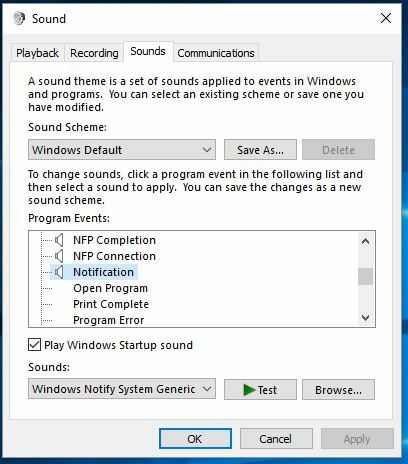 More help on Disable notification sound in Windows 10.